Spring in Tatarstan Investment Development Agency started with a warm, sincere and extremely important women's meeting. Thus, on March 1, a joint event of the Association of women deputies of the State Council of the Republic of Tatarstan "Markhamet-Mercy", Tatarstan regional public organization "Business women of Tatarstan", Association of entrepreneurs of Muslims of Russia (Department of women entrepreneurs), Kazan business club, Public organization of Tatar women of the Republic of Tatarstan "AK kalfak", a number of associations with an entrepreneurial asset was held. "On the eve of March 8, we decided to gather a number of women who with consolidation of the efforts could develop completely unique solutions for the implementation of public-private partnership projects, especially the ones that address acute social issues, such as the socialization of people with disabilities, assistance to children and adults who really need our support. At the same time, we are talking not only about investment, but also about sponsorship projects that are already being implemented in our republic. Socially responsible business is developed in Tatarstan and representatives of the business community and representatives of business-community gathered here today is another confirmation of this. Together we can implement projects important for our republic", - the Head of the Agency Taliya Minullina shared. "Women, first of all, are distinguished by cordiality, responsibility, devotion, sincerity and focus on further results. In social directed work, the meetings on the sites that contribute to the solution of the main issues in this field are extremely important. I am sure, today we will find new points of contact. I have no doubt that from now on we will work more productively on the problems that concern the women's community and the whole Tatarstan", - the Deputy Chairman of the State Council of the Republic of Tatarstan, Head of the Association of women deputies of the State Council of the Republic of Tatarstan "Markhamet-Mercy" Tatiana Larionova stated in her welcoming speech. 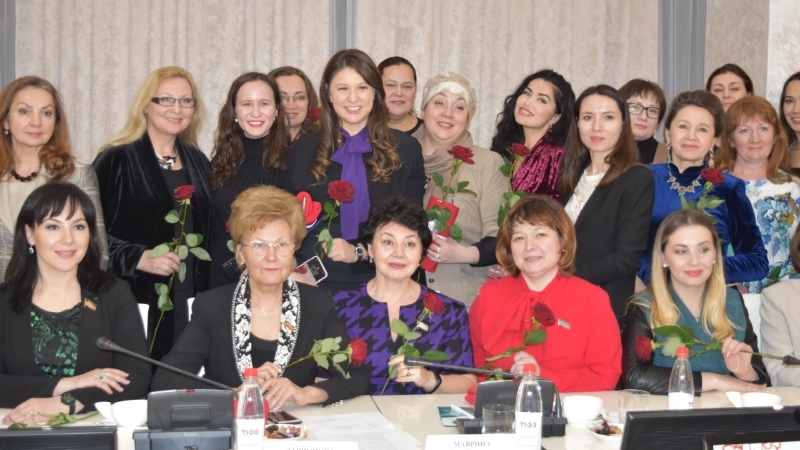 On the eve of the international women's day, representatives of government and business community had a round table discussion on implementation of socially significant projects of Tatarstan, which often, having like-minded people, need funding. In the State Council, the work is coordinated by Kseniya Vladimirova. She represented 9 new and existing projects. "We are together" - the republican project aimed at the socio-cultural development of children with disabilities. The project involves creative groups of Tatarstan, which took patronage of children, and the result of their work will be shown with large colourful performances at the gala concert, which will be held on June 1, on the International Children's Day. "Pearls of Tatarstan" is a round-year project about women with disabilities. It has been implemented for 5 years already. Every year the project ends with a large-scale festival, revealing all the advantages of its participants. Ronald McDonald House Charities is a project which has no analogues in Russia. It was built 5 years ago on the territory of Children's Republican Clinical Hospital for children undergoing long-term treatment. But the uniqueness of the project is that they live in a House with their parents, not separated from them from a few weeks to several months. "Good tales from Mandarin" is the project that originated in the walls of Ronald McDonald House Charities when one of the mothers started to write short kind tales. The project was supported by famous people who came and read them with their parents. Each fairy tale is aimed at giving children strength, first of all, to treatment, to inspire and lift the veil of a bright future. The project is planned to be expanded, releasing printed books with tales, as well as to create an audio version for children who under different circumstances can't read. Certainly, everyone can take part, because, as the guests noted, this is the project in which not only material support is important. "Green library" is implemented in the framework of the Federal party project "Clean country" and forms ecological culture through the love of nature. The project has already developed colorful materials for children, and at the beginning of the academic year 2019, 89 schools of Tatarstan will start elective courses on ecology. The project "Power in children" involves the creation of rehabilitation centers. In the short term – in Leninogorsk. Creative inclusive studio "Emotion" - within the framework of the project, young people with disabilities create performances and show them in children's homes and schools for free, demonstrating to special children that life goes on. Other projects are aimed at promoting family values, strengthening the family institution, career guidance for children with disabilities. "I work with children with intellectual disabilities. The main problem is adaptation to life after boarding school. The solution to the problem is a systematic developing work, which involves a set of motivation outreach activities. For example, we hold special shifts and now we plan to organize a site for the camp with labor workshops. We took the children to construction sites and bakeries, and the employers stopped being afraid of them like the plague, and realized they are just like everybody else, and if you will show them what to do, they will do it. Yes, outwards our children are not much different, but the huge psychological trauma deprive them of the desire to communicate and do something. Our task is to help to find a place where they can be useful. The child's deviations are often the pedagogical neglect, psychological trauma. Legislatively, we want to expand the number of professions offered to people with disabilities and, moreover, to give them an opportunity to choose where to show themselves," - the Head of the Charity Fund "Springboard" Elvira Osokina shared. There were no indifferent ones to the raised topics and issues among those attending. Many of them expressed their readiness to join the joint work immediately. Thus, the artist of the National Museum Milya Nurullina already has a special "tool" for this. She has created a unique technique for drawing for children with disabilities she actively applies. And the blogger Dzhannat Mingazova expressed a desire to provide information support to projects. "The response is evident. We accumulate all the offers to give it life, and life gets better due to this. And even if you help only one child, it is great, and together we can help not to one child, team or elderly", - Tatiana Larionova thanked for the involvement. Taliya Minullina told the guests about the projects implemented by the Agency and investors who are ready to support the desire to provide assistance to those in need. In addition, she reported on the opportunity to present socially significant projects at the meeting of the Investors Club of Tatarstan and noted that she will instruct the Analytical Department of the Agency to provide information on international grants that are applicable for their implementation. "We are very pleased to be able to hear each other. This will help to build a systematic joint work. Following the meeting, we will prepare a list of instructions and consolidate the areas of responsibility, so that in the future we can hold such meetings on a regular basis, and most importantly – to achieve good results," - Taliya Minullina summed up. At the end of the event, leading specialists of the Agency held a colourful presentation about Tatarstan in the Unified Presentation Center, which reflected results of joint work.